Kingdom Konsultant Travel Blog: New Cupcake Alert! 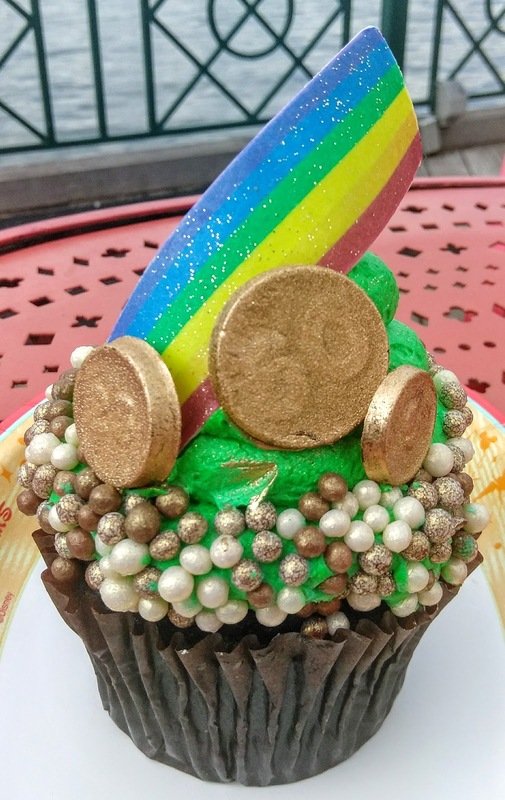 The Rose Gold Cupcake and the Pot o' Gold! New Cupcake Alert! The Rose Gold Cupcake and the Pot o' Gold! 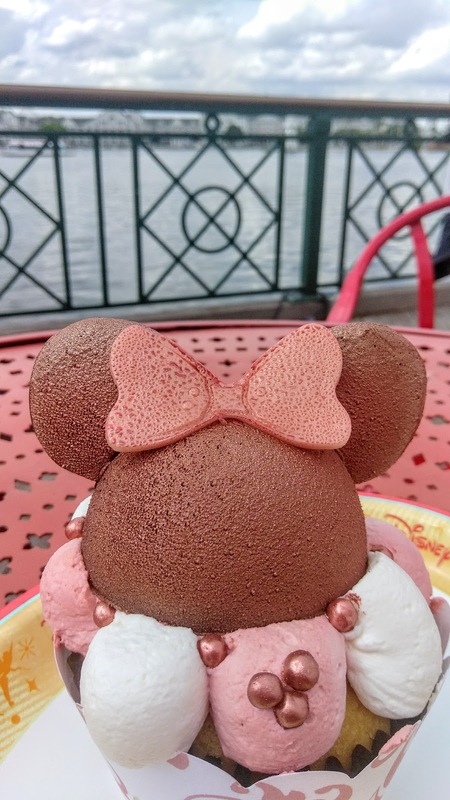 The Rose Gold cupcake joins the ranks of several rose-gold colored desserts around Disney, which are all the rage right now, thanks the the popularity of the coveted rose-gold Minnie ears. It starts with a yellow cupcake, filled with a rose mousse, and topped with pink and white pillows of whipped cream, crispy chocolate pearls, (shaped into a Hidden Mickey! ), and a chocolate pair of Minnie ears. Then we have the Pot o' Gold, which is a chocolate cupcake, with what I believe to was a chocolate-Irish creme filling, and topped with green whipped cream, crispy chocolate pearls, and chocolate coins and a rainbow garnish. So, we started with the Rose Gold first. 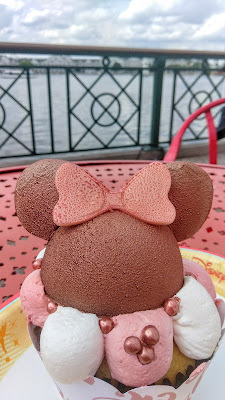 I will admit, I was kind of disappointed to find that the ears were hollow chocolate, and not some bonus dessert on top, but it was good chocolate. The edible rose-gold glitter paint didn't change the taste at all . The whipped topping was light, airy and refreshing. 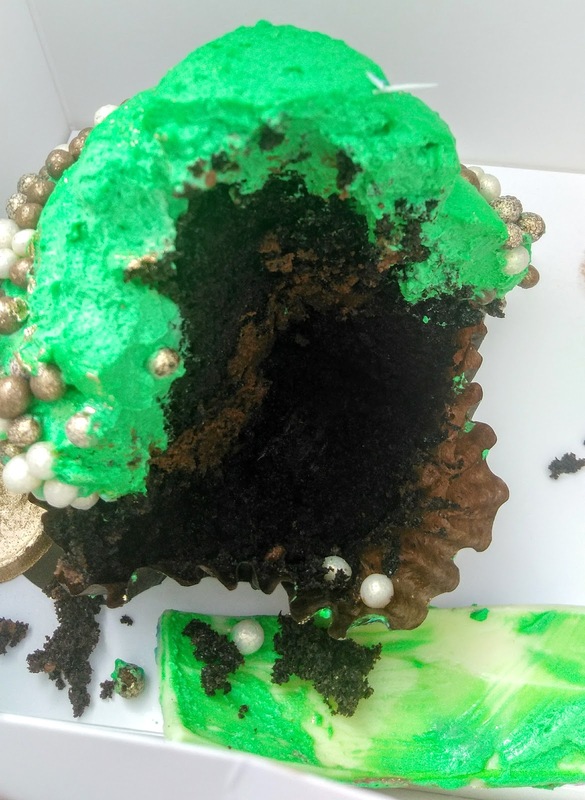 The cupcake was super moist, and the mousse was a nice compliment. I, however, did not taste rose. It tasted like strawberry to me. (Not a bad thing, since I am not a fan of floral flavors in desserts.) Overall, we really liked this cupcake, and I mean... come on..... how cute is that???? Would the Pot o' Gold be as fantastic? Well, this one started with some confusion for me. The woman working behind the bakery counter described this to me as 'chocolate cake, with rainbow filling and green frosting'. Sweet! I love rainbows! I was so sad when I cut this open and saw..... chocolate. Not that I have anything against chocolate. I mean, who does? But I was hoping for a rainbow. Oh, well. Had to settle for the pretty little one on the top. The cake itself was a nice, chocolate sponge. 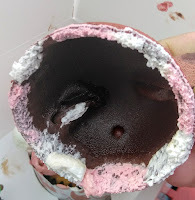 The filling was a a weird cross between a mousse and a ganache. 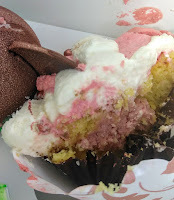 It tasted good and I'm pretty sure I got some Irish creme mixed in with the chocolate, but since I was told the filling was 'rainbow', I am uncertain. I was also disappointed to find that the 'frosting' was actually more whipped cream. I love whipped cream on hot chocolate, and I even enjoy it when I'm playing Pie Face with my Littles, but I do not generally like it in place of frosting. 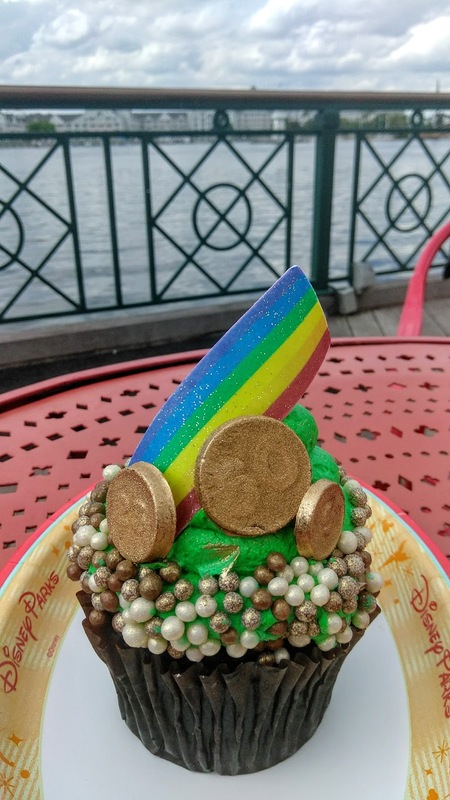 It worked on the Rose Gold cupcake, because it make it kind of like a shortcake kinda deal, but it did not work for me on the Pot o' Gold. The decorations of white chocolate and the chocolate pearls were yummy. My Littles were expecting the rainbow to be a sour gummy candy, but lucky for Mamma, it was chocolate. I'd say the Pot o' Gold was not as good as the Rose Gold, but, man, was it cute! Are you hungry now? I bet you are! Disney does some awesome cupcake confections. 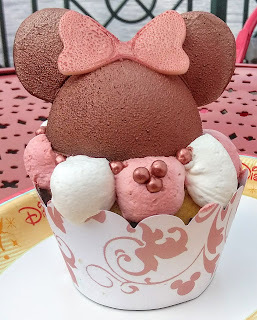 What's YOUR favorite Disney cupcake??? If you're craving some Disney sweets, hit up the agents at Kingdom Konsultants to get your next snack run... I mean, vacation, booked! Until next time, Disney Guys and Gals, have a magical week!! !